Should a captain go down with the ship? It's a tradition that can be traced back to as early as 1852 - captains choosing to stay on their ships until all passengers and crew are safe aboard lifeboats. Recent maritime disasters, though, make it look like the practice is seemingly being abandoned. Lee Joon-seok, captain of the Sewol, the South Korean ferry that sunk last week, has come under fire for abandoning the ship while hundreds of passengers remained on board. Dozens of them died and more than 200 were still missing Monday. South Korea media reports, the ferry captain has been charged with abandoning his boat, negligence, causing bodily injury, not seeking rescue from other ships and violating "seamen's law." 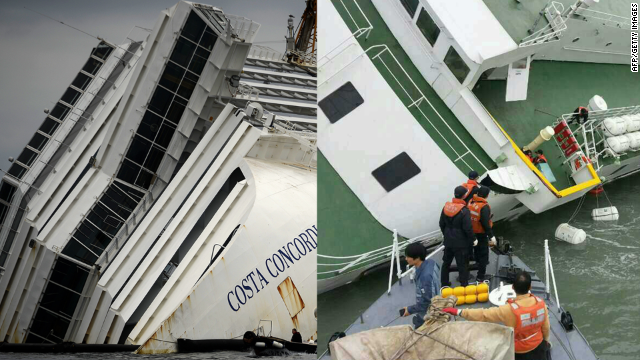 The actions of the South Korea captain have been compared to that of Captain Francesco Schettino, who commanded the cruise ship Costa Concordia, which crashed into a reef of the coast of Italy in 2012, killing 32 people. Witnesses said Schettino jumped into a life boat to flee the ship while hundreds of passengers remained on board. ...and I hope there'll be finally JUSTICE for the ones left alone on the abandoned ship (by the captain, by the officers on board and on land, by the shipping company, by the "rules") ... these rules OF THE WHOLE MARITIME INDUSTRY musT BE CHANGED and the ones lialble for the "accidents" must pay so they'll eventually learn no more put safety before profit and not will repeat the same negligences again !